Members of the Open Class corps Louisiana Stars perform during a recent rehearsal camp. • Listen in on the newest drum corps from Louisiana • How you can own your very own drum corps equipment truck • Find out what the Cadets are eating for lunch this weekend • And more! The Academy The Academy will once again fundraise as part of the Waste Management Phoenix Open's Birdies for Charities program. Blue Knights Tickets to the 2015 Drums Along the Rockies DCI Tour event are now on sale. This year's edition of the longstanding competition will take place on Saturday, July 11, at Sports Authority Field at Mile High in Denver. Blue Stars With a new equipment trailer on its way for the corps' 2015 tour, Blue Stars is selling its old 48-foot trailer. Boston Crusaders Inspire Arts & Music, the parent organization for the Boston Crusaders, announced a new partnership this week with the Blessed Sacrament Color Guard. "When we started to look at new ways to strengthen our commitment to the arts, we wanted to find an organization that embodied all of the same principles we hold true in our entire organization," Rudy Gowern, Inspire's director of business and program development, said. The Cadets See what's on the menu and the schedule for the Cadets' rehearsal camp this weekend at Valley Central High School in Pennington, New Jersey. Jersey Surf A Jersey Surf brass player shares one of his most memorable moments as a member of the New Jersey corps in a new video posted to YouTube. Legends Legends member Braedon Kibby had the honor of performing with the U.S. Army All-American Marching Band last weekend in San Antonio. 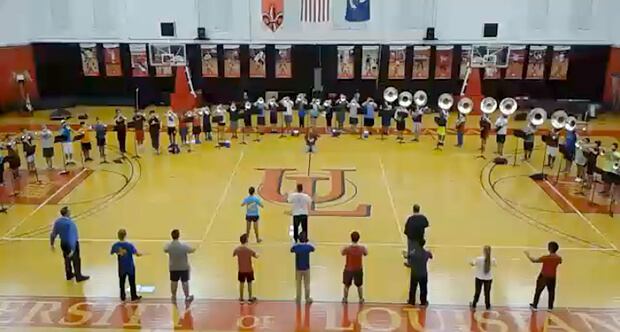 Louisiana Stars Check out this video clip of Louisiana Stars' 2015 brass section performing at a recent rehearsal camp. Madison Scouts Filmmakers of "Scouts Honor," a documentary about the Madison Scouts, are pursuing a new crowd-driven distribution model. Learn how you can request a screening of the film in your hometown. Santa Clara Vanguard Santa Clara Vanguard is saddened this week by the passing of program coordinator Mike McCool. The organization is planning a memorial around one of its upcoming rehearsal camps.